Figure 11 Axial MIP image from the CTA of a patient with bilateral RAS. 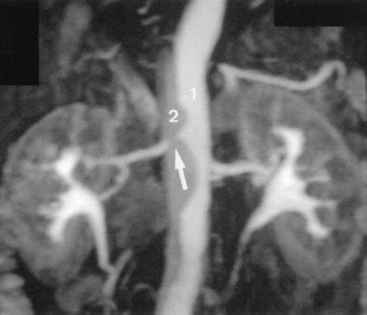 The heavily calcified left renal artery ostium (arrow) partially obscures the stenosis. Abbreviations: CTA, computed tomography angiography; MIP, maximum intensity projection; RAS, renal artery stenosis. Source: Courtesy of Robert Morgan, St. George's Hospital, London. from this single acquisition. Both renal ostia can thus be displayed to best advantage on a single study compared to perhaps multiple runs of conventional angiography. Two distinct methods of imaging are available: flow-enhanced and contrast-enhanced techniques. Both of these techniques rely on the effect of flow to provide a large differential in signal between flowing blood and stationary tissue. They are limited in that they can visualize only the proximal 3 to 3.5 cm of the renal artery; only around half of the accessory arteries are shown, and turbulence seen as signal loss may overgrade stenosis as occlusion (52). Published sensitivities and specificities for significant stenosis are 53% to 100% and 65% to 97% respectively (86-90). The advent of newer magnetic resonance (MR) systems with stronger, faster gradients have made gadolinium-enhanced scans possible and rendered these methods obsolete. Abbreviations: MR, magnetic resonance; SMA, superior mesenteric artery; TR, time to repetition; TE, time to echo. patients with diabetic nephropathy. Care should be taken when using it in these patients, but in general, the available data suggest that gadolinium is much safer than conventional contrast. Gadolinium is dynamically injected intravenously to enhance the signal from blood by shortening its T1 value. Images are acquired during a single breath-hold using a high-resolution 3-D T1-weighted gradient echo technique, pre- and postcontrast. Scanning should be performed in the coronal plane with 2 to 3 mm sections from the anterior border of the aorta back (91). The precon-trast images can then be subtracted, thus improving the vessel-to-background contrast. Image quality is significantly increased by using a phased array coil. Images from the mesenteric vessels to the aortic bifurcation can be acquired in a 20 to 30 second breath-hold (93-95). As with CT, the timing of the scan is important. Too early, and there will be inadequate arterial enhancement; too late, and there will be excessive venous and soft tissue enhancement. The optimum start time can be determined by using a 2mL contrast test bolus and performing sequential single slice imaging of the aorta to ascertain the transit time to the renal arteries. Alternatively, an automatic bolus-triggering software that starts the scan when the level of enhancement in the aorta reaches a threshold is now present on most MR systems. A dose of 0.2 mmol/kg of contrast is injected at a rate of 1.5 to 2 mL/sec. Additional precontrast T1 and T2 fast spin echo images may be obtained to assess the renal size and detect parenchymal disease, morphological anomalies, and adrenal pathology. Newer scanners read central k-space first, which encodes contrast, and fill peripheral, spatial k-space later. This allows the contrast data to be acquired early in the breath-hold when there is maximal enhancement. The data should be viewed on a workstation with multiplanar reconstruction capability. Coronal and axial MIP images may be generated from the 3-D volume, producing an angiographic image (Fig. 12). Multiplanar projection images are useful in analyzing the renal artery ostia, especially when there is superimposition of the renal vein. Recent experimental work has also explored the value of functional renal MRI. Binkert et al. (96) studied renal artery blood flow and renal volume with MR and found that it had a 91% sensitivity but only 67% specificity for the prediction of a clinical response to angio-plasty. These methods await further validation, but they may extend the potential of MR in atherosclerotic renal disease (97). Figure 12 Coronal view from a contrast-enhanced MR angiogram in a patient with a type B aortic dissection. The renal arteries arise from the true lumen (1); the false lumen is marked (2). 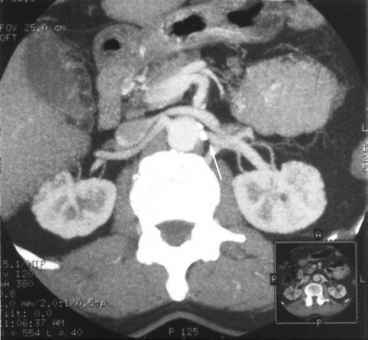 Note the associated stenosis of the right renal artery (arrow). Abbreviation: MR, magnetic resonance. Source: Courtesy of Joe Brookes, The Middlesex Hospital, London. significantly better with contrast MRA than noncontrast MRA, with a detection rate of 82% compared with 49% (Fig. 13A,B). Most of the arteries missed on contrast MR either were very small or originated from unusual locations. In another meta-analysis, this time comparing different diagnostic tests for RAS, Boudewijn et al. (51) found CTA and enhanced MRA to be significantly better than the other tests. They calculated receiver-operating characteristic (ROC) curves for the different modalities and found areas under the curve of 0.99 for contrast MRA and CTA. 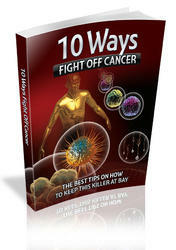 This signifies that these tests can achieve a high sensitivity at low rates of false posi-tivity. The results of other studies on contrast-enhanced MRA of the renal artery are shown in Table 10 (33,46,53,99-106). With regard to grading of stenosis, MRA has been found to have the same interobserver variability as conventional angiography (46,107). Like CTA, MRA can demonstrate secondary changes seen in RAS, i.e., post-stenotic dilatation (Fig. 14), reduction in size, asymmetrical enhancement, and concentration of contrast. Conversely, a study by Qanadli et al. (46) observed that with a normal MRA, RAS could be reliably excluded in 98% of patients.